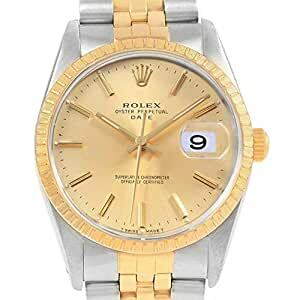 ROLEX DATE MENS STEEL YELLOW GOLD JUBILEE BRACELET MENS WATCH 15223. OFFICIALLY CERTIFIED CHRONOMETER AUTOMATIC SELF-WINDING MOVEMENT. STAINLESS STEEL AND 18K YELLOW GOLD OYSTER CASE 34.0 MM IN DIAMETER. ROLEX LOGO ON A CROWN. 18K YELLOW GOLD ENGINE TURNED BEZEL. SCRATCH RESISTANT SAPPHIRE CRYSTAL WITH CYCLOPS MAGNIFIER. CHAMPAGNE DIAL WITH RAISED GOLD BATON HOUR MARKERS. DATE WINDOW AT 3 O’CLOCK APERTURE. STAINLESS STEEL AND 18K YELLOW GOLD JUBILEE BRACELET WITH FOLD OVER CLASP. FITS 7.5″ WRIST.. SKU 19657. BUY WITH CONFIDENCE KNOWING EACH TIMEPIECE GOES THROUGH THE SAME RIGOROUS 31-POINT INSPECTION. REST ASSURED ONLY AUTHENTIC PARTS STRAIGHT FROM THE MANUFACTURER ARE USED. THE CERTIFIED PRE-OWNED PROGRAM ON AMAZON ENSURES PEACE OF MIND AND TRANSPARENCY VIA STANDARDIZED REPORTS AND A 1 YEAR WARRANTY PROVIDED BY WATCHFACTS.